Vera Brühne grew up in Essen-Kray as the daughter of the mayor of Kray-Leithe. She was married to the actor Hans Cossy and they had a daughter, Sylvia (1941-1990). Her second husband was the composer Lothar Brühne but this marriage ended in divorce as well. She became well known after Dr. Otto Praun and his housekeeper and lover Elfriede Kloo were found murdered in 1960 in Praun's villa in Pöcking near München. At first it was believed to be a suicide, but after it became clear that she inherited his proporty in Spain the bodies were exhumed and she and her acquaintance Johann Ferbach were charged with murder. She was pretty and the court case attracted a lot of attention. Allthough she persisted in her denial that she was guilty she was sentenced to imprisonment for life. Not only had her daughter given evidence against her, she had also tried to bribe witnesses. In 1979 J.J. Strauss pardoned her and she was released from the prison in Aichach. Ferbach had died in prison in 1970. After her release she called herself Vera-Maria Adam and she lived in het old house in Munich. She was buried in Cossy's grave after she died in 2001. In that year Die Zeit concluded that the investigation hadn't been sound and that she shouldn't have been convicted. 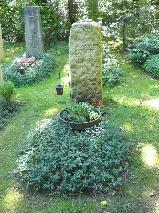 The grave of Vera Brühne and Hans Cossy at the Waldfriedhof Solln, Munich.